Graco Children's Products has added more than 403,000 child seats to last month's recall of 3.8 million to replace faulty harness buckles. But the added seats won't end a dispute with the U.S. government's road safety watchdog. The National Highway Traffic Safety Administration still wants Graco to add 1.8 million infant seats to the recall because they have the same buckles. 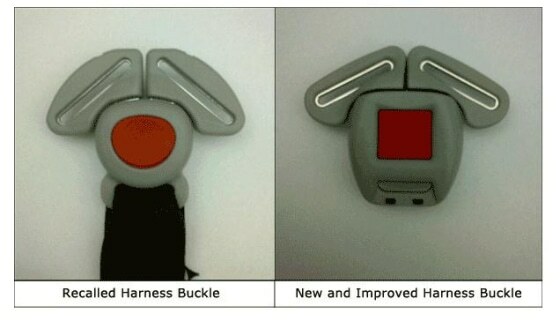 Graco is expanding its child seat recall related to sticky buckles. Buckles can get gummed up by food and drinks, making it difficult to remove children. In some cases parents have had to cut harnesses to get their children out. The agency says the problem increases the risk of injuries in emergencies. Graco said in a letter to the agency that it found additional toddler and harnessed booster seats that should be recalled. The 403,222 seats added to the recall include 2006 through 2014 Argos 70 Elite, Ready Ride, Step 2, My Ride 65 with Safety Surround, My Size 70, Head Wise 70 with Safety Surround, Nautilus 3-in-1, Nautilus Plus, and Smart Seat with Safety Surround, according to NHTSA documents. In its letter to NHTSA, Graco said it didn't include the infant seats because they are used differently than the toddler seats, and because in an emergency, an adult can remove the whole seat from the car rather than unlatch the buckle. "Graco looks forward to further discussions with the agency to resolve any remaining issues relating to those additional car seats," the letter said. Atlanta-based Graco, a division of Newell Rubbermaid Inc., has until March 20 to explain why last month's recall didn't include infant seats. The recall, now at 4.2 million, is the fourth-largest child seat recall in American history. If the infant seats are added, it would be the largest such recall.